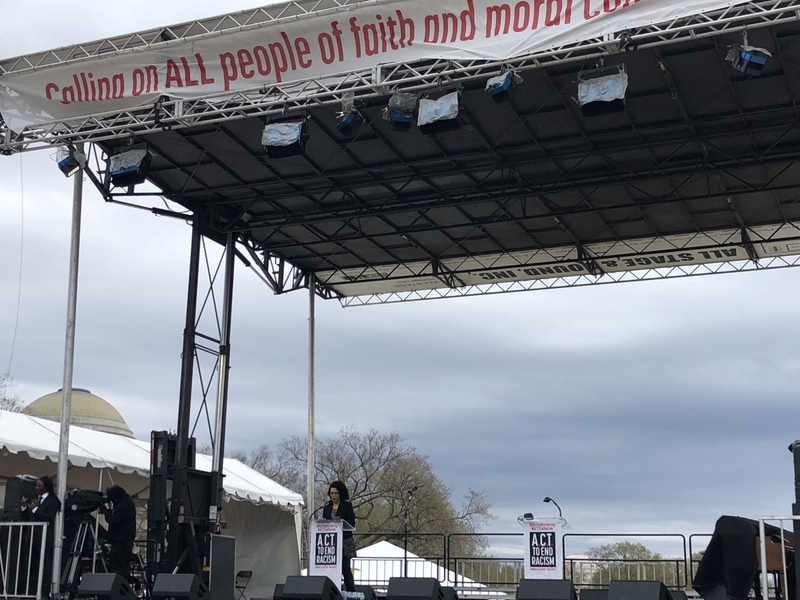 This afternoon, April Baskin, URJ Vice President for Audacious Hospitality adressed the crowds at the Rally to End Racism in Washington, D.C. More information on the event can be found at www.rally2endracism.org. Shalom Brothers and Sisters and All the Blessings in Between – It is good to be here with you today. My name is April Baskin and I serve as a Vice President at the Union for Reform Judaism, which leads the largest and most diverse Jewish movement in North America. As a Black, Jewish woman who is observing Passover this week, I joined my fellow Jews in the retelling of our people’s biblical exodus from enslavement in Egypt to liberation. Every Passover, I also viscerally recall the more recent enslavement of my great, great grandparents near Okalona, Mississippi and Clinton, North Carolina and all my relations who came before them who courageously endured the dehumanization and violence of American chattel slavery. Notice that I didn’t say that I recall the enslavement and liberation of my fellow Black people here in the United States, because, devastatingly, liberation has not yet been achieved. The Rev. Dr. Martin Luther King, Jr.’s “I Have a Dream” vision still remains an unrealized dream when more black men are behind bars or under the watch of the criminal justice system than there were enslaved in 1850. And it remains an unrealized dream when our nation remains deeply segregated, disparities between the rich and working poor are at an all-time high, and voter suppression is once again in full affect. It is time to justly and lovingly hold ourselves and this country accountable to creating a new paradigm outside of the enduring plague that is white supremacy. But we aren’t going to do it via denial. We aren’t going to accomplish it via attack and humiliation—those are the master’s tools. We must Reflect, Relate, and Reform. Reflect - We must courageously, directly stare racism and white supremacy in the face, take time to learn about all the ways racism is operating in society, and within ourselves, today and historically. Relate - We must face and dismantle racism piece by piece not in isolation, but working together, particularly with those who are most directly targeted by racial oppression. In beloved community, across lines of difference, we can take action with a loving, justice- and equity-focused ferocity that many of us have rarely seen our lifetimes, but that I know we possess. Reform - What do I mean by Reform? I mean ACTION. Honoring and being informed by the leadership of people of color, particularly women and trans folk of color, we need to take both individual and collective action to mindfully, lovingly and accountably dismantle the master’s house of white supremacy, together, arm in arm. And when we encounter oppression or bias within our movements, rather than using the masters tools of distancing and attack, we can LOVE ourselves and each other into greater accountability. Not one of us disposable and we can maintain our highest ideals while practicing compassion and opportunities for growth and evolution. This is complicated and difficult, but, believe me, we DO have everything we need to do this sacred work—and win.] Now is the time to ACT to end racism and bring Dr. King’s vision to life. Today is a new day, in which we have the strength and vision to walk and work together in beloved community with loving accountability. This Jewish woman of color has come to say, let us move forward, full throttle, because on the other side of this plague of racism...is liberation. On the other side of this plague is true safety. On the other side of this plague is the full realization of the Rev. Dr. Martin Luther King Jr’s vision of beloved community. Let’s get free y’all. In the spirit of liberation and joy, I recite Psalm 96, Shiru l’adonai kol ha’aretz. Sing unto God and this great country a new song. We will sing unto God a new song.